Gracie Barra Garden Grove hired me to take over their Local SEO campaign and they were only receiving 1-2 leads from the internet a month. They were stuck on the fourth page in Google and beyond for major keywords related to the metro area– Orange County, and nd were not ranking within the first five pages of Google for keywords related to most cities bordering Garden Grove. Due to moving three times, the inconsistent information (name, address, and phone number) across business listings was the worst case I have ever worked with, which resulted in their Google My Business listing not ranking in the “3-Pack” for keywords related to Garden Grove. Up to this point the school sustained from a healthy flow of referrals due to running great kids and adult programs, but like many schools, sign-ups from referrals resulted in a plateau much lower than needed for a basic income. After performing an on-site audit, I identified “thin pages” (not enough content) and worked with Gracie Barra Garden Grove to add informative, compelling content to program pages so each had 700+ words, photos and videos. Then, I created unique pages for each city bordering Garden Grove to rank for martial arts and Jiu Jitsu + the each city name. Off-site optimization proved to be the biggest challenge due to the many business listings that contained information from their current and previous two locations. After auditing over 70 listings, my assistant got to work fixing incorrect business listings and building any listing needed on the top 50 directories in the United States and 50+ other generic directories. To create local and niche relevance signals, we built 20 listings on the top martial arts and local directories. Digital advertising to get an almost immediate spike in traffic by managing your Google AdWords campaigns. Ranking your Google listing and website at the top of Google search results. Within 5 months Gracie Barra Garden Grove improved from 1-2 leads each month from the internet to 15. Not only did they see their total number of leads increase by over 700%, but they also noticed an increase in the quality of leads due to the content overhaul; prospective students were quoting specific pieces of information added to the site that compelled them to request a free trial. Improvements in keyword rankings include first page rankings in Google for the highest priority keywords related to their metro area and seven closest cities. 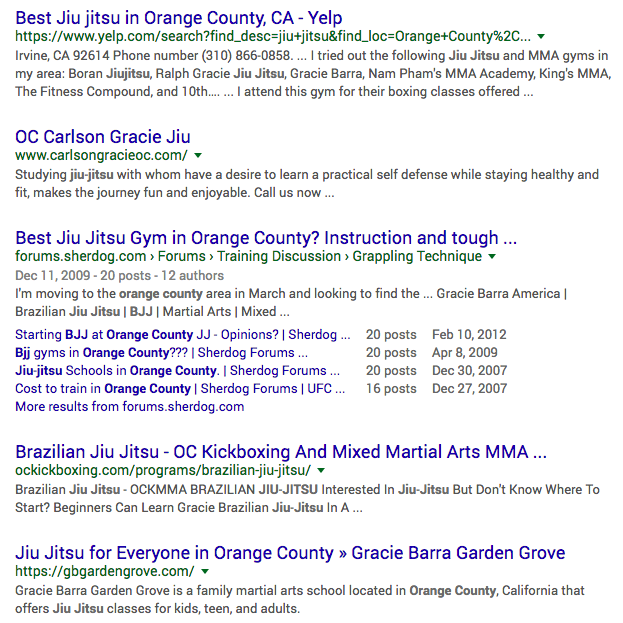 Pictured to the right are Google’s organic search results for “Jiu Jitsu Orange County” has the most traffic of all keywords we targeted. Fill out the form on the next page to tell me about your school.